An implement used for removing the cork from wine bottles. There are many varieties available, but three types are the most commonly used. One variety is a "T" shape with a long pointed spiral attached to a handle. It is twisted into the cork and pulled which releases the cork from the bottle. Another variety is similar except that two levers are used to lift the cork from the bottle. The levers move upward as the spiral is twisted into the cork. The levers are then pushed down which forces the spiral, and the cork, to be moved upward and out of the bottle. A third type uses friction to remove the cork. It consists of a handle from which are extended two thin, stiff, but flexible prongs of metal that are spaced apart from each other about the width of the mouth of the wine bottle. The prongs are inserted along the cork and into the bottle. 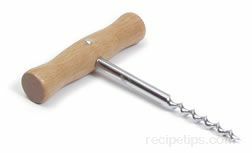 The friction between the prongs and the cork allows the cork to be removed as the implement is twisted and pulled out of the bottle.